Posted on July 29, 2016 by Norwich Radical	in Community, Inter|national, Student and tagged business, coalition government, competition, consumer, education, education system, education tax, game of loans, Game of Thrones, graduates, inequality, live within our means, loans, monopoly, Pokémon, Queen, student experience, student loans, students, tef, tuition fees, tuition fees hike, UEA, university, university fees, University of East Anglia, university of manchester. Some might think that the universities of Manchester, Kent, and Durham are jumping the gun a bit as MPs are yet to vote on the increase in parliament but I’d rather see it as an eager sign of increasing students’ experiences rather than a money grabbing exercise. We will all remember being constantly instructed by our most benevolent regime to ‘live within our means’ and that acquiring debt is terrible for a country but a must for university students. What we constantly forget however is that education is a business, not only education but everyday transactions are business in nature and laced with competition. How can I make money from visiting my elderly grandma? You may sit up in bed at night and wonder or walking faster than someone on a travellator and feeling a small burst of satisfaction that not only did you beat another human being in an unacknowledged race but you also beat a machine whose sole purpose it is to make people get to their destination quicker. When higher tuition fees were introduced under the 2010 coalition government we knew that this meant an increase in competition between our higher education institutions and only the most elite highest achieving universities would raise fees to the £9,000 maximum — until it didn’t and nearly all universities charged the same flat rate. But this is set to be remedied by the government’s planned Teaching Excellence Framework (TEF), whereby only educational institutions deemed truly excellent will be honoured with the ability to hike fees. Think of the proposed increases as a medicine for troublesome youths. It’s for their own good and it’s best to start accumulating debt early to set yourself up for a long life playing an adult version of Pokémon — gotta catch it all right? But also let’s not forget some of my personal favourite tuition fee doublethinks: “we’ll probably never earn over £21,000 anyway so what does it matter?” “the debts whipped off when you’re 50 anyhow”, “it’s not proper debt like a mortgage or another sort of bank loan”. Whilst tuition fees are set to rise with inflation the minimum threshold to pay back your student loan will not; tough Tory love to get those graduates motivated to stop working at a coffee chain or fast food restaurant. it’s best to start accumulating debt early to set yourself up for a long life playing an adult version of Pokémon — gotta catch it all right? Through all this, intake in universities has increased since tuition fees have trebled and the numbers cannot lie. Even with the scrapping of maintenance grants (a motivational shove off a cliff for young nurses through converting their bursaries to loans), and the freeze on the minimum payback threshold, and a rise in tuition fees on the table, ever more young people have gone to university. My one of a multitude of issues with this is that we are still many years away from feeling the true impact of huge amounts of debt on graduates. The some £30,000+ debts that an average graduate will leave with is too dizzying a number to properly grasp. People my age will have most likely never seen a sum that large in their short lives (not even in the days of Monopoly with the family) the numbers lack real grounding (much like the money in Monopoly). This is a statement perhaps supported by the decrease in part-time mature students over the age of 25 at English universities that are seemingly put off by the substantial amount of debt. Or perhaps younger students see this huge debt as a ‘well we’re all screwed now’ situation that lumps us all into a life married to large monthly outward payments, forgetting about the unequal payment rates from the ‘bank of Mum and Dad’. 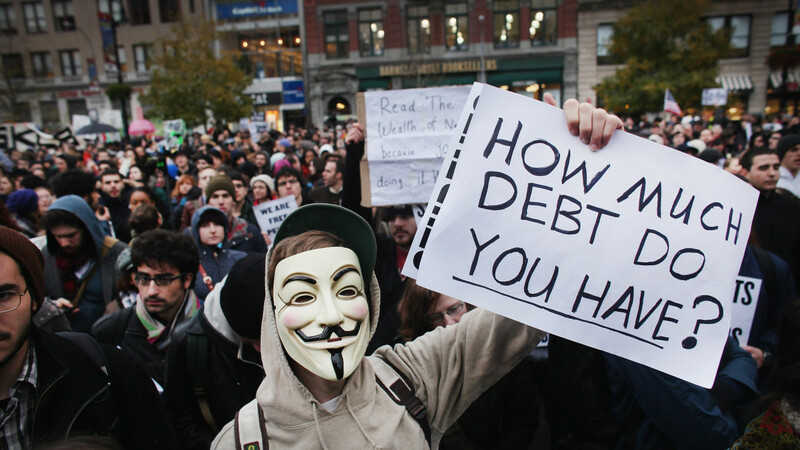 Label the government loans as an education tax for graduates and be done with it. Label the government lineqoans as an education tax for graduates and be done with it. The capitalisation of our education system is not a solution for fighting inequality — it is a method for tying us to debt that most of us will never pay back. All the while our current Tory dynasty can just play with these student lives at their fancy, freezing minimum payment thresholds at a whim or eventually planning to sell student debt to private organisations, or even moving the goal posts past the age of 50 if they felt the need, just as they moved the age for receiving a state pension back. I recently read an article that outlined how the writer was wrong when he once believed tuition fees were bad and that they help to combat inequality in education. He continues that the area we should be focusing on is secondary education, pumping money into that sector to nurture our teenagers so that they thrive (coming from someone who has not had to deal with the increased levels of education debt). But why do we have to choose between the two? Graduates should feel more hopeful equipped with a degree, not filled with a constant low anxiety when they picture their very real debt where there are no winners like in the Monopoly days.